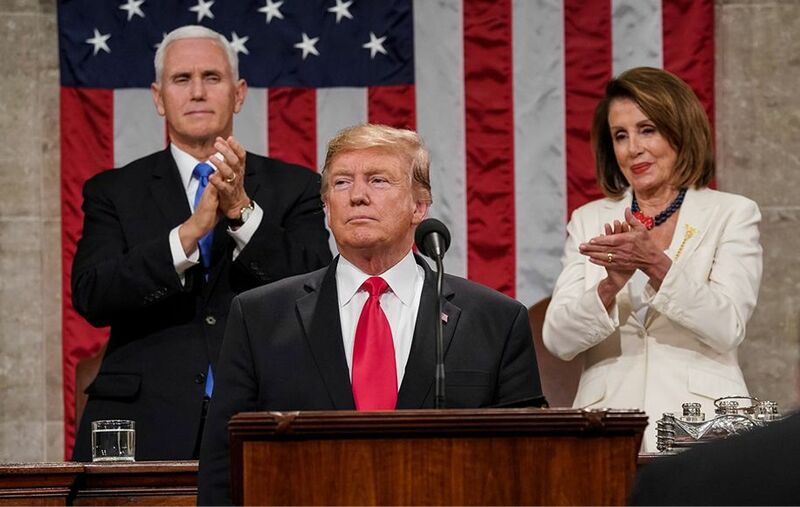 With the deadline looming to reach a border security funding deal, President Trump used his second State of the Union address to simultaneously call for bipartisan cooperation and renew his demand for a southern border wall that Democrats have refused. “We must reject the politics of revenge, resistance, and retribution,” Trump said, “and embrace the boundless potential of cooperation, compromise, and the common good.” Nevertheless, the president vowed to build a wall with or without the support of Congress. If lawmakers do not provide wall funding, he said, “I’ll get it built.” However, Trump stopped short of saying he would declare a national emergency to bypass Congress, after Senate Majority Leader Mitch McConnell warned him that many Republicans would see such a maneuver as a dangerous precedent. “Trump offered a thin sheen of ‘unity’ over large helpings of the same old polarizing demagoguery,” said The Washington Post. It was hard to take his calls for bipartisan cooperation seriously when he doubled down on his false and inflammatory rhetoric about the “tremendous onslaught” of illegal immigrants or the Democrats’ eagerness to “execute” newborn babies. He sounded like a nervous blackmailer when he claimed that “ridiculous partisan investigations” will sink the economy. If there are going to be any actual bipartisan accomplishments over the next two years, the leadership will have to come from Congress. Actually, “this was a dud of a speech,” said Benjamin Wallace-Wells in NewYorker.com. A wounded president had an opportunity to reset the agenda with some bold new policy proposals. Instead, Trump offered up the same old “snuff-film roll of immigrant crimes” and the laughable boast that his skillful diplomacy has saved the country from nuclear war with North Korea. Two years into the Trump presidency, it feels as if American politics has “reached an intermission.” A divided Congress is ideologically stalemated, the White House is bracing for multiple investigations, and soon the 2020 presidential race will overshadow everything. Read between the lines, said Greg Sargent in The Washington Post. “Trump is demanding nothing less than total capitulation” from the Democrats. Despite losing 40 House seats in the midterms and being forced to surrender in the shutdown fight, Trump refused to back down from the divisive immigration agenda that voters “soundly rejected.” He also painted any attempts by the House Democrats to perform their constitutional oversight duty as a threat to the nation’s security and prosperity. Right now, Democrats and Republicans in Congress are frantically negotiating over border security “to disable a ticking time bomb that Trump himself set.” Trump’s speech suggests he’s still willing to let the bomb go off if he doesn’t get his way. On the cover: Sens. Bernie Sanders, Elizabeth Warren, and Kamala Harris.